Nov. 6, 2018 | 2:35 p.m.
Breakfast enthusiasts understand the importance of a quality maple syrup. But the real stuff often isn't in the big bottles that line grocery store shelves — no, genuine maple syrup is a product resulting from a meticulous practice of tapping trees and cooking sap. And even though it's produced in the spring, maple syrup is a year-round household staple. The sweet liquid was a North American staple long before hungry children started using it to douse their morning pancakes. Maple syrup was a major source of sugar for many Native Americans living in regions around the Great Lakes. Over the course of the past several centuries, maple syrup production has become a booming industry. Ted Simpson, president of the Wisconsin Maple Syrup Producers Association, recounted this history and explained how it is refined in a Nov. 29, 2017 talk recorded for Wisconsin Public Television's University Place. Wisconsin ranks fifth in North America for maple syrup production, following the Canadian province of Quebec, and the states of Vermont, New York and Maine. But, as Simpson explained, the Dairy State is one of the fastest growing places in terms of its maple syrup output. For Wisconsin's commercial and home producers alike, the proper time to collect sap for maple syrup is during the late spring and early spring months of March and April. However the exact time for tapping sap can change depending on variables like weather and the presence of invasive species. "On a good year we should get three major sap runs, and these are separated by cold spells typically," Simpson said. Tapping trees for sap is a relatively simple process that can be done with tools bought from a local hardware store. To produce syrup, the sap is boiled and then cooled. Indeed, hobbyists' interest has grown over the years, Simpson said, because it's relatively easy to make quality syrup with at-home supplies. “People cook their sap inside a turkey cooker!” he exclaimed. There are nearly 150 varieties of the maple tree around the world. Some of the more common types are the silver and red maples. The trees can live for up to 400 years and so far, research has shown that tapping them for sap has had no effect on their lifespan. The amount of sap each maple produces can vary by season, but it's not uncommon for an average tree to yield around 20 gallons of sap. Finding the right trees to tap can be tricky, especially in the fall and winter months when there are no leaves to help with identification. When this is the case, bark is the best identifier of a maple. The hard maple, also called the sugar maple, has a rough, scaly bark and tends to have more delicate limbs. Soft maples, such as the red and silver, tend to have smoother bark. It’s common for new syrup producers to accidentally tap an ash or oak tree. There are four key steps in maple syrup production: tapping, collecting, cooking, and the process of filtering and bottling. When it comes to making sure syrup lasts on the shelves, bottling and sealing it when its temperature hits between 180-190 °F is the best way to ensure flavor and quality for years. Many products promoted as maple syrup in grocery stores aren't actually maple syrup; rather, they're sweeteners made with other sugars and have an additional artificial flavor. Pure maple syrup is derived from cooking sap, and it's through that process in which the genuine maple flavors are created. Maple syrups can have different flavors depending on the location of the trees tapped for their sap. Minerals in soil help determine sap's chemical makeup and flavors. Just as wines from different vineyards have distinct tastes, so do different maple syrups. Maple syrup is graded on a scale to determine its flavor profile. Grade A Golden is the lightest grading on the spectrum, and is followed by Grade A Amber, Grade A Dark and Grade A Very Dark, which are used more by commercial sellers. As the grading progresses, the color of the syrup gets darker and the maple flavor is stronger. Lighter grades typically come earlier in the season and darker grades tend to come later. Because of the potential health benefits that maple sap contains, "maple water" is said to be the next trendsetter's drink of choice. It posses many of the same nutrients as coconut water but has a sweeter, more palatable taste. 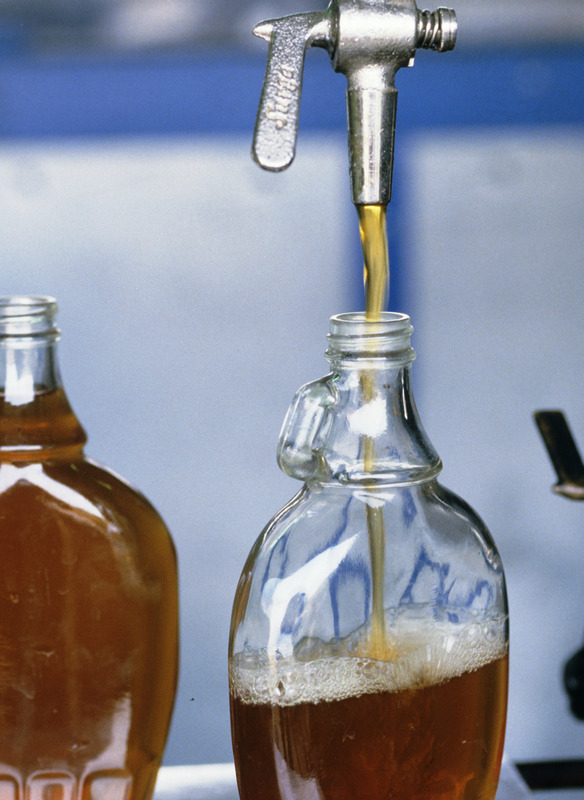 Maple syrup is bottled following an intense process of cooking and condensing. On the roots of maple syrup in Wisconsin: "A long time ago when the Native American tribes were the origin of maple sugar production in our state and in our nation, sugar maple trees were almost unlimited in the original forests. So, they had a great resource for making the sap. There's main legends that exist in the Native culture about maple syrup and they used to treat it almost as a sacred item from the tree, from the Earth. The manufacture of sugar was one of the principle Native American industries." On tapping a red maple tree: "We've gotta be careful though, because they tend to bud earlier, and once the buds come out then you don't get a good flavored maple syrup. It's called buddy syrup. So if you have a lot red maples in your sugar bush, you've gotta be careful that you don't take that sap after the buds have matured, or they'll off — it'll taint your syrup flavor." On how much sap is needed to produce syrup: "How much sap does it take to make a gallon of maple syrup? … It can vary a lot. There was a researcher and proctor called Professor Jones, back in 1903, developed what's called the 'Rule of 86.' So if you take the sap test, how much percent sugars in the sap divided [by] 86, you'll get how many gallons it's gonna take to make a gallon of syrup." On the labeling of syrup products: "One of the things that our association is trying to do is work with the international associations to make sure labeling is correct. So that these big companies aren't putting something like maple, or have a picture of somebody collecting sap, and there's nothing maple in it."